El Nido is a paradise I’ve been longing to visit. I’ve heard a lot of amazing things about the place and I know you did too. We all know that it is listed as the most beautiful island in the world. With that title, my expectations were set so high. But as like all things, it has good and bad side. Not really that bad, but I know some of the things can get better. So here are some of the things I would like to share with you during my visit in El Nido. Hope I can help you prepare what to expect visiting the place. I’ve been part of a lot of backpackers Facebook groups. It is a community where we can ask some tips or any recommendations of the place. One time, I saw an American girl posted that she didn’t expect that El Nido is more pricey than the other destinations she went in Asia. It’s her first time in the Philippines, and Palawan is her first destination. At that time, I had a bit of an idea how pricey it will be. A LITTLE I supposed, since I was still shocked the moment we were in the area. We arrived in El Nido passed 10PM and we went for a walk to eat something, we saw a homemade ice cream store and asked how much, the lady said “It’s 90 pesos for one scoop” . Really? So we opt to buy a cheaper once, Cornetto. And the advertisement of ‘Saan aabot yung 20 pesos mo’ didn’t work in El Nido. It was Php45.00. More than twice of its exact price. Well, our first night definitely gave us the concrete idea that this place is meant for people who can afford to spend more, and not a for budget travelers for sure. I can sleep everywhere. It’s a talent. I don’t mind a cheap place as long as I have a place to shut my eyes. However, I’m with my family and I want them to be comfortable during this vacation. I did our itinerary and to tell you honestly, I’m not really good in creating one. So I asked a friend who recently visited Palawan. She was very helpful and she recommended a place just near the beach area. I reserved a room good for six people. I did not search for other accommodation since I trusted her when she said it was okay. Maybe okay for a group of millennials our age but not good enough for my parents. I was actually embarrassed about it but they were very understanding and we just moved on. So if you want comfort, you have to stretch your wallet further. As we were checking the area, I was pretty much excited about the beach. We passed by a lot of stores and small cafe’s. We continue to walk until we saw the shore. It was full of restaurants around the area and believe me, I did not expect what I saw. The main beach is only for docking of tourist and fishing boats. It was not ideal for swimming; you can’t even relax while lying on the sand. Pretty much, you can only have a decent swim if you will go island hopping (which is another cost by the way). To be honest, I was pretty disappointed about this fact. I was pretty much happy about our island tour. But during the trip, here’s what I learned. 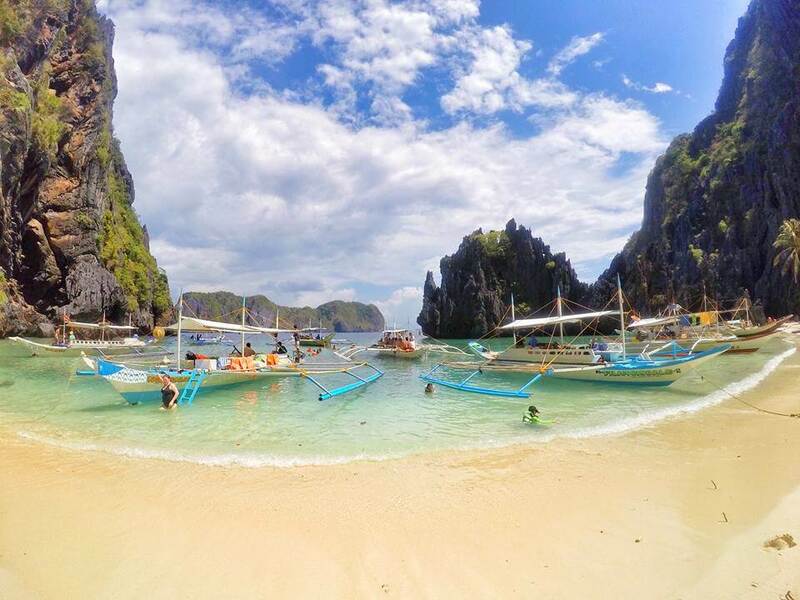 You can have a lower price when you book an island hopping tour in the El Nido. It is much cheaper. For example, we had the combined tour A and C which I booked online. It cost Php2000.00 per head. But if you will ask directly in the tour booth, it’s only Php1500.00 . You can save a lot! Our guide also said that the four French were haggling about the rate because it was pricey for them. But they took the tour with us with a lower price than what we paid. My cousin brought her broadband with her. It didn’t work in El Nido at all. And to be honest, it is not useful in the area that much since the area is small and we didn’t need any google maps. It was pretty not a big deal to me not updating my social media. But if you are working online, it might be a problem. Did you like the post? Share your thoughts on the comment box below! Also, I need some love on my Youtube Channel. Subscribe now!